Joshua Bloom is CEO and co-founder of wise.io, the machine intelligence company. He is also an astronomy professor at UC Berkeley, where he teaches Python for data science. He has been a Sloan Fellow, Junior Fellow at the Harvard Society, and Hertz Foundation Fellow. In 2010, he was awarded the Pierce Prize from the American Astronomical Society. Josh holds a Ph.D. from Caltech and degrees from Harvard and Cambridge. 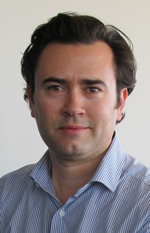 He serves on the Berkeley Startup Cluster Advisory Committee.